I recalled on one of my visits to the Northshore that Tammany Trace had a trailhead in Abita Springs. While I was not familiar with that location, I definitely have enjoyed an Abita beer or two. I knew there had to be an interesting story behind this New Orleans’ favorite brewery. So off I went, starting my trek at the Covington trailhead. Knowing the distance from Covington to Abita via the Trace was less than four miles, I timed it perfectly to have lunch at the pub. 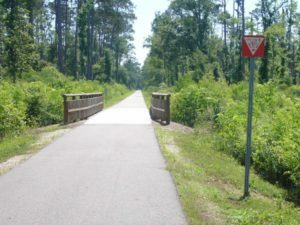 Tammany Trace is a great way to get from one area to another in St. Tammany Parish. No car required! The scenery between the two trailheads is simply breathtaking. With the trees, plants and all of the flora the perfect shade of green, Tammany Trace is beautiful this time of year. The Abita Springs Brewery has a visitor center and offers guided tours. The tour is well worth the cost of $5, as you learn a great deal about the history and brewing process. I learned that Abita Springs is one of the most green-friendly breweries in the country, utilizing modern technologies to use 70% less energy than traditional brewing methods. And, beer tastings are included! The Abita Brew Pub is the place to enjoy a pint of one of the Abita-brand beers. So why I now try to remain gluten-free, I had to indulge in one of the old-time favorites, Purple Haze. It was just as tasty as I remembered it. I was craving a burger with avocado, but I just could not bring myself to ordering one named “California Burger” with avocado and sprouts. I decided to go full Louisiana, ordering the Deep South Burger. It did not disappoint. 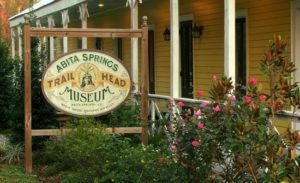 The Abita Springs Trailhead Museum is just steps from the Abita Brew Pub. Since it was a glorious day with no rain in sight, I thought I would take the time to visit the Abita Springs Trailhead Museum. I had seen the yellow building before while I was driving through the area. 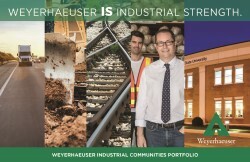 The museum has several exhibits and artwork to enjoy, and the admission is free. I did not realize there were so many cool places in Abita Springs. It was time to head back, but a return trip is needed to see more of the town. And, of course to sample more beer!